Tear off a corner of a signed card and restore it instantly. This is a very visual torn and restored card effect. There is no unnecessary folding of the card or other funny business. Ray teaches you in detail how the gimmick has to be constructed. You probably do not have all the materials lying around on your table, but all components are readily available. You will learn five ways to perform this restoration effect. Can be adopted to business cards. 1st edition 2009; 18 pages. 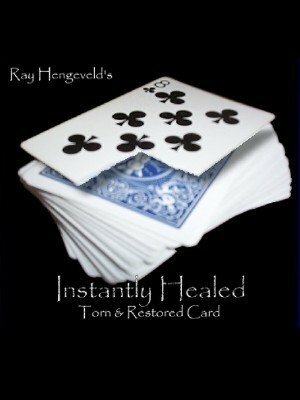 I was asked t review the trick "Instantly Healed" by Ray Hengeveld. I am certainly not a ‘household name’ among magician's. I studied with Slydini for eight years and perform for laymen at private parties, hospitality suites and trade show booths. If I am going to add a trick to my performance list, the trick must be dependable. It has to be practical ... commercial. While I will occasionally meet a person who is generally interested in the Art of Magic, most laymen simply wanted to be entertained and are not concerned with technique. So when I see a trick like "Instantly Healed", a trick that enables me to perform a very nice ‘close up illusion’, a trick that is dependable, and workable in a real world circumstance, I appreciate it very much. Ray has created a trick with a beginning, middle, and an end. The construction is logical and the actions of the magician can be justified in the mind of the spectator. There are some subtle things going on that will inspire thought and creation in the mind of the magician. The manuscript is sincere in its effort to provide the reader with complete instructions and offer alternatives of performance and method.